A FOND FAREWELL – The intimate Prinsendam has occupied a special place in the hearts of Holland America Line guests and now after nearly 17 years of service, she is leaving the fleet on July 1, 2019. All her itineraries will continue as planned through July 1 , 2019. There is still time to celebrate this beloved ship. Join us for one of her upcoming farewell sailings and experience all of Prinsendam’s many pleasures for a final time. Set sail with the Carnival Dream and prepare for seven days of refreshing cruising around the Caribbean from New Orleans and back again! Calling on rare destinations such as Belize City and Roatan makes this sailing notable. This route is a typical one for the Dream. November and December may mean cold weather for the Big Apple, but it’s always summertime in the Caribbean. Your first stop on this 11-day cruise through the islands is Puerto Rico, where the secrets of Old San Juan are yours to uncover — stroll this historic, walled neighborhood brimming with 16th- and 17th-century Spanish colonial buildings. In lush St. Lucia, hike at the base of the Piton peaks or take a dip in the deep-blue Caribbean Sea. Keep your camera ready when in St. John’s to photograph the only working Georgian dockyard in the Eastern Caribbean as well as the breathtaking views over sailboat-studded English Harbour. Back in New York, make time to reflect at Ground Zero, stroll stunning Central Park, peruse The Guggenheim or the American Museum of Natural History, or even take in a Broadway show. For tickets and information, be sure to visit the Funny Stop’s website here. Through The Norwegian Edge, Norwegian Gem has undergone ship wide enhancements. Come on board and experience newly designed public areas, revamped Haven spaces, fresh decor, modern finishes and more! Revive, refresh and recharge in the Mandara Spa® and Body Waves Fitness Centre. Start with a hot-stone massage, one of over 50 specialty treatments offered by the well-trained massage therapists. Then unwind in the Thermal Suite with a steam or dip in the Vitality Pool. Freedom, flexibility, and fun is at the core of a cruise vacation onboard the Norwegian Jewel. Unconstrained by set meal times, you are free to dress, wine and dine as you wish at 16 fabulous complimentary and specialty restaurants, lounges and bars on board. The Norwegian Jewel features a great variety enthralling entertainment options, such as the Magic Show and the marvelous Le Cirque Bijou. 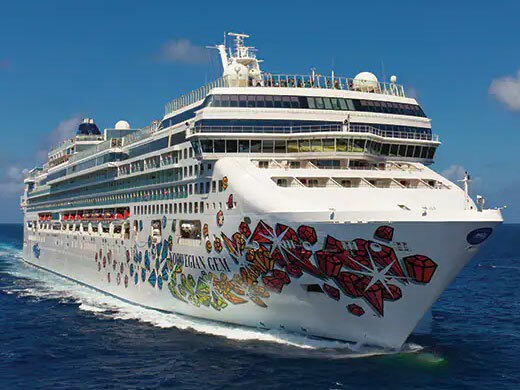 The Norwegian Jewel entertains up to 2,376 guests on sea days with an outdoor sports complex, video games room, casino, art gallery, and a range of age-appropriate facilities to keep the kids entertained. Be sure to pamper yourself at the Polynesian-inspired Bora Bora Health Spa and Beauty Salon and rejuvenate at the fully-equipped Body Waves Fitness Center. 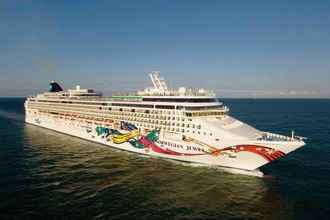 Experience your dream cruise vacation to Asia and Alaska on board the Norwegian Jewel. Take a stroll through Charlottetown to see the beautiful Victorian architecture and visit the many historical landmarks, such as Province House and St. Dunstan’s Roman Catholic Basilica. In Nova Scotia, you can experience the haunting majesty of Halifax. Make your way from the second-largest natural harbor to Halifax Common, the oldest public park in Canada. Then scale Citadel Hill to visit Fort George and the Halifax Clock Tower. Maine’s most populous city Portland will leave quite an impression with its incredible architecture and cuisine. Visit one of the many museums and then make your way to the Arts District to indulge in one of the many restaurants. See a new side of Canada & New England with Norwegian. Onboard, you’ll find 12 unique places to eat and 11 exciting bars and lounges where you can just hang out. There’s even a bowling alley (a cruise industry first!) and rock climbing wall onboard. In Concert for the Fijian ‘Islanders’. 4) 3 Days and Nights in Pago Pago, Tutuila. LIVE IN NEW ZEALAND – LORD OF THE STAGE !!!!!! Take a look at the nightly entertainment available on this cruise ship. Mr. Strong is very grateful to be a part of this thrilling line-up. ‘The Sanctuary’ – Solitude seekers will be able to escape completely to this plush, outdoor spa-inspired setting with signature beverages, light meals, massages, attentive service and relaxing personal entertainment.